Defense Minister echoes other ministers in giving 'full confidence' to ISA, despite the alleged brutal torture of Duma suspects. Defense Minister Moshe Ya'alon (Likud) on Tuesday became the latest in a string of politicians to give full backing to the Israeli Security Agency (also known as Shin Bet or Shabak), despite serious charges of brutal torture being conducted against Jewish suspects in the lethal Duma arson. "I have full confidence and I give full backing to the Shabak (ISA) head Yoram Cohen, to members of the general security service and the Shabak in general, in light of the contemptible attacks they are experiencing in recent days," said Ya'alon - who just last week admitted there is no evidence against the Jewish suspects. Ya'alon's statements join those of Prime Minister Binyamin Netanyahu, Jewish Home chairperson Naftali Bennett, and Justice Minister Ayelet Shaked (Jewish Home), who all threw their total support behind the ISA earlier on Tuesday. That support came in the wake of attorney Itamar Ben-Gvir accusing the ISA of sexually abusing his minor client during the course of the interrogation, amid a string of already-damning evidence of torture mounting against the intelligence body. According to Ya'alon, the ISA is trying to defend the security of Israeli citizens against Palestinian Arab terror, and "they also work to prevent Jewish terror groups from conducting their plans against Palestinians and others, in a manner that will deteriorate the security situation in Israel." 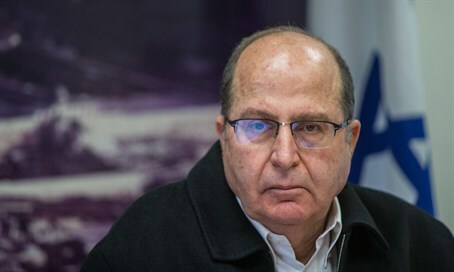 Ya'alon once again reiterated his claims that the Duma murder "was conducted by radical Jewish terrorists," while stating that the charges against the ISA accusing it of cruel and unusual torture are baseless and false. Opposition to ISA "causes illegal actions"
"Those who give a tail wind to those who attack the Shabak and those who serve it, spread lies and incite the public against the security system, are responsible indirectly for illegal actions by those on the margins," said Ya'alon. "The goal of the investigation that they are conducting is to put on trial ruthless terrorists who conducted terror activities," claimed Ya'alon. "If we don't place our hands on them and bring them to justice, they are liable to commit additional terror activities to murder innocents and to set the region ablaze." His claims of impending danger echo the counter-terror law being used in the investigation, which allows ISA to prevent meetings with a lawyer and employ a certain level of torture in unusual "ticking bomb" cases in which there are definite suspicions that a terror suspect is imminently going to conduct an attack. Many argue the law has no place in the Duma case, given that the arson was committed in July and there does not appear to be reason to believe the suspects would be an immediate threat. Ya'alon concluded by calling on MKs, ministers and public leaders to give their backing to the ISA. Despite Ya'alon's assertions that the ISA's conduct is lawful, civil rights groups have called for the ISA to be investigated over the torture, which - if proven - may run contrary to Israeli law. In one case, the ISA was found to have illegally detained one of the suspects, a minor, for longer than the 20 days mandated by the counter-terror law. Numerous protests have followed revelations that the suspects have reportedly been refused basic religious rights such as lighting Hanukkah candles and praying, been banned from seeing their lawyers or families, and that at least one has been denied medical treatment after being beaten during arrest. Damning audio evidence released earlier this week during a court hearing included one suspect testifying that he attempted suicide and begged for the ISA to kill him because he could not bear the torture any longer. The suspect's arms were found to be covered in numerous scars, providing further backing to his statements.